a11yLDN (Accessibility London) conference is returning on Saturday 26th October 2013 and will take place at Mozilla London, 101 Saint Martin’s Lane, London WC2N 4AZ. The schedule for the day hasn’t been announced yet but the conference will run from 11:00 am to 5:00 pm. 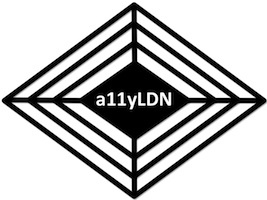 As usual, a11yLDN is aimed at end-users, web designers and developers, editors and authors, accessibility specialists, universities and companies, and charities – in fact anyone who wants to learn more about web accessibility. This year’s theme is ‘Creativity, Innovation and the Future’ but sessions will also cover issues relevant to the wider field of web accessibility. Attendees will be able to choose from a selection of presentations and workshops. My presentation this year will be on the evolving state of accessibility within WordPress – the world’s most popular Content Management System (CMS). I’ll look at how WordPress has improved its accessibility record over the years – both within themes that control how a WordPress website looks, and within the administration area. But I’ll also focus on the things that aren’t right, and the open development structure that can sometimes hinder accessibility and occasionally take it back a few steps. Looking ahead to the future I’ll cover initiatives being undertaken to make sure things like that don’t happen again. My presentation will finish with an invitation for everyone to get involved. It really is possible for anyone to influence WordPress for the better. And the Make WordPress Accessible team needs your help to do just that. For more information about the event visit the a11yLDN website. Tickets are free but limited. You can reserve yours via the a11yLDN 2013 page on Eventbrite.